Visiting A Chocolate Museum in Paris?! Going into the third week of our European vacation, our girls were over the museum scene. I really can’t blame them, I’m not a superfan either. But for some reason, taking advantage of museums seems necessary when traveling. 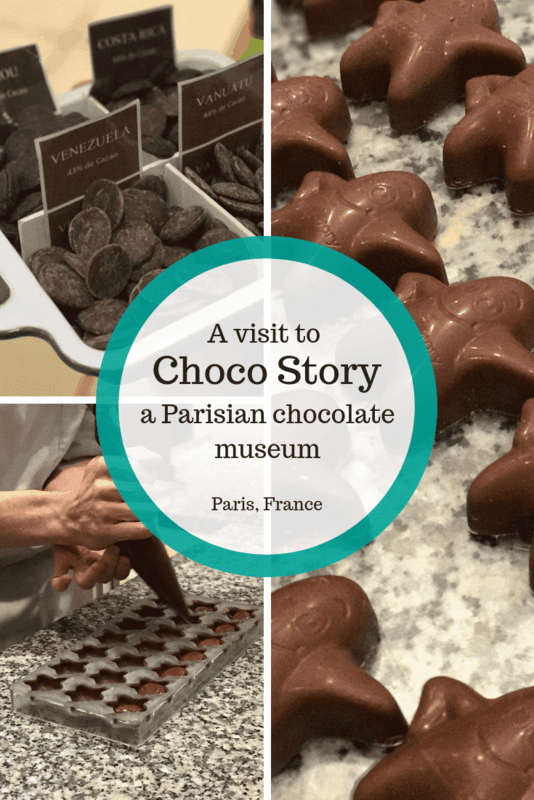 However, things changed for all of us when I found the Paris Chocolate Museum, Choco Story. This chocolate museum experience changed the way we all think about chocolate. Do I get to taste chocolate? YES! Choco Story is a small museum where you actually get to learn, taste, and make chocolate treats. We happened to visit on a cold wet Paris day and our timing couldn’t have been better. We were the only tourist around for the first two hours. We got to take a private lesson on how to make chocolates and devour as many samples as we liked. When you first enter the museum area, you start to wonder if you’re in the right place. And is there really the promise of hot chocolate at the end? What you don’t realize is the small museum is actually two stories and the entire first floor is rich in history. You can download the audio or just walk along a self-guided tour. Once upstairs you’ll find more historical artifacts. You’ll be escorted into a room that has stadium like seating, and you’ll watch a film on the history of chocolate. After the brief film, you’ll get a live demonstration on how to make different candies. This is also where you get to try several different types of chocolate. We weren’t in any hurry that day and decided to let our kids learn how to make chocolate. It was such an amazing experience as we were the only ones in the room. The kids put on aprons and got a personalized French lesson on making chocolate candies. It was hard for our youngest not to devour everything in sight. The lesson was fun, and we got to package up our chocolates to take with us. As we were escorted out the door, we finally realized that our last stop was the promised hot chocolate. But it wasn’t what we expected at all. They had many different flavors… Milk, Dark, Salted Carmel… but instead of pre-mixed hot chocolate, or a powder to add like we’re used to, you got a stick with a block of chocolate on it that you stirred around in a cup of hot milk to melt and mix in the chocolate. Our girls loved this… and so did we. This museum location felt like it was far away from where we stayed. But when in Paris, you tend to roam around and purposely get lost anyway. Public transportation plus Google maps make it so easy to get around. Don’t let a distance away from your base stop you from visiting this little gem.